This tour is for people who know how to appreciate "the drink of the Gods". 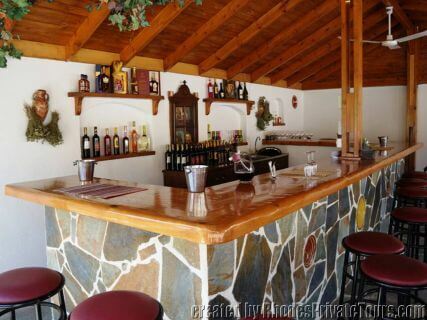 Why not taste the island's local produce in wine, which holds a long - standing tradition? A tour to Rhodes Wineries is addressed mostly to the selective wine tasters, but not exclusively. White wine from the white grape variety Athiri (VDQS), a classic Aegean variety cultivated in the wider area since antiquity. Red wine (VDQS) from a red grape variety which has come to dominate almost all islands of the Aegean . Mandilaria (often also called Amorgiano) has found the most suitable environment for its requirements on Rhodes . Enjoy this dark wine with its delicate aroma of red fruit. Sweet white wine (VDQS) produced by blending two varieties of Muscat grapes. Classic white Muscat (from Samos) and the Italian imported Trani Muscat blend harmoniously producing aromas of dried apricot, caramel and nuts and creating a pleasant taste that enchants the senses. Local wineries specialize in producing sparkling wines even using the champagne method of second fermentation in the bottle. Private Tour Description: "Rhodes Wine Tour"
If the Tour Start from Rhodes City, then we will include the Highlights of Rhodes New Town. We drive up the hillside to Monte Smith, Acropolis of Rhodes City, for a panoramic view of the town (Stop Visit Photos) on the way we visit the Old Harbor, and the North point of the Island. 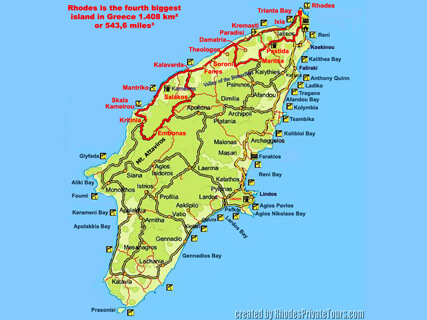 Then you'll be driven to South West of Rhodes 55 km / 37 miles to Embona Village using an inland route. On the way we stop close to the Valley of the Butterflies to a small traditional local winery of Mrs. Anastasia. The Anastasia's winery was started on 1995 and later on 2002 moved here to this beautiful location. She started with only two wines and now she is producing more than 10 different type of wines. Athiri, Red wine Mandilari, Muscat, Cabernet Sauvignon......She is also producing Souma (distillate of wine) and extra virgin oil of olives. She is using biological growth and biological process for the vineyards and wines. Here you have the opportunity to test all the types of wines she produces, and get your pictures of the ageing facilities. Then we continue south west to Empona, admire the Island's lush vegetation along the drive towards this beautiful village which has known days of glory in the past. The drive along the mountains path will surely reward the visitor. Empona the large village at the foot of Ataviros mountain, is the most important grape producing village on the island, which combines folklore, a lively atmosphere and good food at the local traditional tavernas. The Triantafyllou family, owners of Emery Wines, first entered the beverage business in Rhodes in 1923 mainly as distillers. Exporting spirits worldwide, the company was one of the few of its kind to survive the second World War. In 1966 the company began making wine on a large scale. In 1974, a winery was constructed near the village of Embonas on Mount Atavyros, in the heart of the island's best growing region. Today Emery is one of Greece's oldest wine and and spirits producers and occupies a position high on the list of the country's largest wineries. The name Emery originates from Emeric D'Amboise of French origin who was the Great Magistrate of Rhodes from 1503-1512. Free wine tasting for visitors is available and pictures of the ageing facilities. We continue with Dionysos Free Wine Tasting. 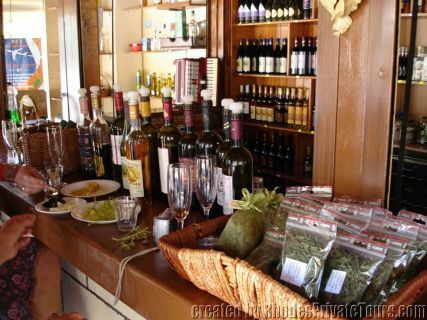 Here you can taste a big variety of fresh wines and the strong local spirit Souma of Merkouris Winery. The Kounakis winery started from the grandfather Kyriakos Kounakis on 1928 and it still produce excellent wines till today, they can produce more than 20000 bottles of wine a year. They use the traditional natural way for growth and process. Athiri, Mandilaria (Amorgiano) Merlot, Grenache rouge, Syrah, Chardonnay. Here you can test free all the types of wines they produce, and get your pictures of the ageing facilities. The Alexandris winery it is a small second generation wine producer, started by the father Michael, and now his sons Stergos and Panayiotis run the winery. Panayiotis studied in France Enologist Winemaker in the university of Montpellier, they use French wooden barrels, they produce Red wine (VDQS), White wine from the white grape variety Athiri, Sweet white wine (VDQS)... Free wine taste and pictures. Embona also is a known place by locals coming from everywhere to eat grilled meat. Here you can really feel the Greek life; the wineries and restaurants have the perfect traditional sensation. Back through the west coast with breathtaking views of the Aegean Sea. Private Tour Extensions: You can extend or change the itinerary of this private tour as you like. You can add lunch time at a local traditional tavern in Embona / Rhodian cuisine and perfect house wines, or add the attractions you wish to visit. Q: Do we have to pay for the wine tasting? Are there any entrance fees? A: No entrance fees. The wine tasting is free. Q: We aren't big wine connoisseurs but do appreciate it, can we taste any type of wine we wish? Q: Is there a requirement that we purchase a certain amount of wine? A: No you don't have to purchase any amount of wine. Q: How we get information about the wines we taste? A: You will get detailed info on every winery from the wine makers while you taste the wines. Q: Do we get drunk at the end of the tour? A: No, you don't get drank, we never had drank clients.